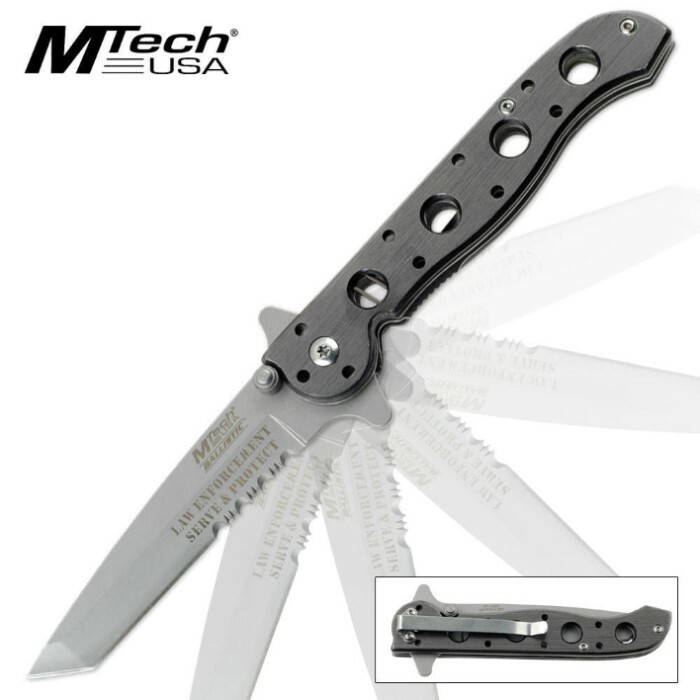 MTech Ballistic Assisted Opening Folding Pocket Knife | BUDK.com - Knives & Swords At The Lowest Prices! Whether you're law enforcement or not, this MTech Ballistic assisted-open folding pocket knife won't let you down. The 440 stainless steel tanto blade is partially serrated with a razor-sharp edge and piercing point. The blade spur and thumb stud engage the assisted-opening mechanism, giving you a fast-access blade that's always at the ready. The handle features a brushed matte finish and pocket clip. Hey, it's an MTech! How can you go wrong at under $8.00 and FREE Shipping? This is another great knife from MTech. It is a little lighter than most, but very well built and you can see and feel the quality! Hey, grab one or two, you won't be sorry! Good knife opens quick. This is one of about 3 knifes I purchased from this site that has an edge sharper then a butter knife.